Even secrets have a way of floating to the surface. It’s the seven bandaid swim that clinches it. It’s what convinces Cassie that there is no way she’s going to swim at the local pool any longer. From now on she is going to swim in the lake. The lake covers Old Lower Grange, which was purposely drowned on the day Cassie was born. That day was important for everyone, especially Liam, a boy who joins Cassie at the lake. As summer heats up, the water level of the lake gets lower and lower. Slowly the dark secrets of Old Lower Grange are uncovered and soon, both their lives will change – forever. The seed for this story was planted a very long time ago. When I was in Year 7, my class went on a camp to a town called Tallangatta, in north-eastern Victoria. Tallangatta is near Lake Hume and was actually drowned in the 1950s to make way for the expansion of the lake. When we were there, the water was quite low, and you could see some of the remnants of the old town above the surface, including the beginning of a road that led down into it. I remember being taken by the idea of setting off along the road and following it underwater all the way into the town. It doesn’t make sense, but because there was a road, it felt possible somehow. That image sat in the back of my mind for years until one day the line The day that I was born, they drowned my town came to me, and the rest of the story slowly built itself around that. My father is an amateur potter and likes sculpting people’s heads, some of which have ended up in our garden. When Walker Books told me they’d like to publish Surface Tension, I thought it would be a good idea to ring him up for a chat, given the way Cassie’s potter father is represented in the story. Luckily he understands that, although stories often contain elements drawn from a writer’s life, they spin off wildly from there, and are, in fact, fiction. My younger brother is a civil engineer who works with dams and irrigation systems and all that sort of thing. This proved very handy when I was trying to finish up the rewrite of the novel and realised that the way I had set the dam/lake up really made no sense and had to be completely overhauled, which of course sent alarming ripples all through the story. He also told me something I hadn’t heard of before writing the story, about a case of insurance fraud which came to light when a flooded town was exposed during a period of drought. The idea of a crime being uncovered under those circumstances, as far as I knew, was entirely my own invention – possible, of course, but a work of imagination all the same. I was a competitive swimmer in my childhood and have spent a lot of time going up and down the black line, dodging bandaids and stealth attacks from other kids. I much prefer swimming in open water – ocean, dam, river – and favour isolated quiet over crowds. Those aspects of Cassie are definitely drawn from me. 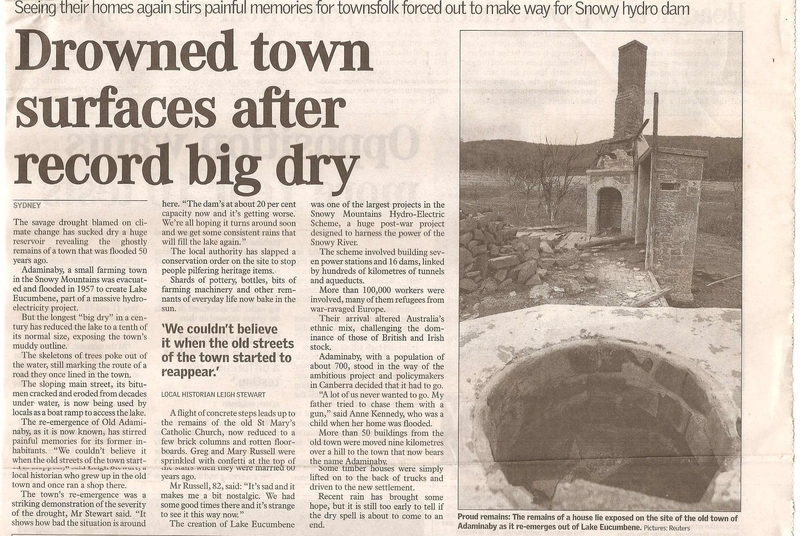 The images below are from an article I clipped from a newspaper way back when I first started thinking about the story (the article is not about Tallangatta but about Adaminaby, a town in NSW which met a similar fate; there are towns like this all over the world). I particularly love the anecdote recounted by a woman named Anne Kennedy about how her father, opposed to the flooding, tried to chase the authorities with a gun. I don’t have an incident like that in the book, but did try, via Cassie, to honour that sense of attachment to place, to point to some of the debates that must have raged around these sorts of proposals, and the ways in which official histories can erase or smooth them over. The writing of this book was supported by a Development Grant from the Department of Culture and the Arts, Western Australia, for which I am immensely grateful.